Thảo luận trong 'ENGLISH' bắt đầu bởi Olaf von Voss, 17/4/19 lúc 23:12. In order to really transform your Sony FS7 / FS7 II into a real ENG camera, you have to employ some kind of 2/3″ zoom lens which is a versatile tool to use if you happen to shoot fast-paced reality shows or news programs. The new Sony LA-EB1 B4 mount lens adapter is exactly that. When combined with the CBK-FS7BK Build-up Kit you’re up to the task. But the resulting ENG-style FS7 won’t come cheap! 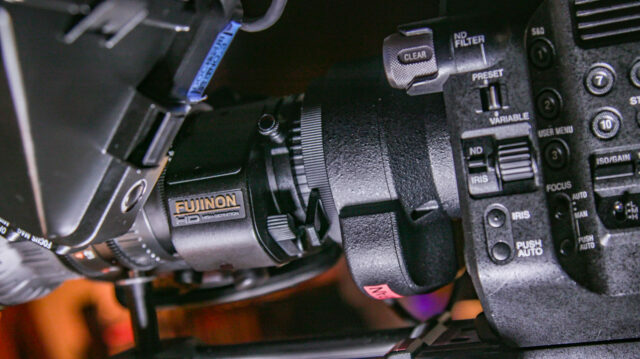 A Sony FS7 II paired with a Fujinon ENG zoom lens. The vital link? A brand-new Sony B4 mount. If you want to go on the ENG journey, you might want to take closer look at the new LA-EB1 B4 mount adapter Sony has announced, alongside the CBK-FS7BK build-up kit. With it, you can use regular B4 2/3″ ENG lenses with your FS7 / FS7 II and the nice thing is that this adapter only costs you 0.6 stops of light. What is the gain, you ask? Deploy any standard 2/3″ ENG style lens to the FS7 / FS7 II and your good to go. These lenses are not exactly cheap but compared to cine zooms with equivalent zoom ranges they come as a present. Sony LA-EB1 B4 mount adapter. While a B4 adapter for this camera is not a new thing, the LA-EB1 B4 adapter stands out here because it’s able not only to communicate with the lens attached and power it directly, but it also sends lens data straight to the viewfinder of the camera hosting it. So again, think ENG here: all the mission-critical information is right in front of you – without extra cable clutter and accessories. Fs7 II with CBK-FS7BK build-up kit and LA-EB1 E/B4 mount adapter (and a 2/3″ ENG zoom lens). The LA-EB1 B4 mount adapter will cost you US$5.600 (5.000€). That’s a pretty penny, when the FS7 II already costs around US$9.000 (8.100€). Just as with the The CBK-FS7BK called build-up kit, the new B4 mount adapter won’t be available until December 2019. Plus, and that might be vital, the according Sony CBK-FS7BK build-up kit (V-mount / audio extension, shoulder pad/plate and dedicated EVF) already costs around US$7.300 (6.500€). So the grand total is about $ 21.900 (19.521 €), which is not cheap at all. A proper XDCam will cost you about the same but without an EVF and without the battery plate..
What do you think about using the FS7 / FS7 II as an ENG camera? Is it the future of TV? Are the days of traditional ENG camcorders over? Share your thoughts in the comments below! 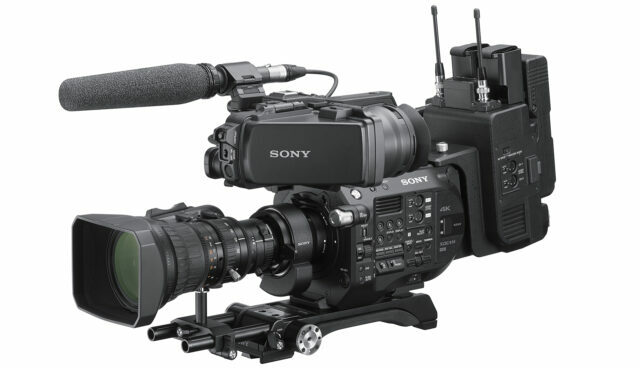 The post Sony Introduces a B4 Mount for FS7 / FS7 II – Complete Your S35 ENG Kit appeared first on cinema5D.